In 1912, the Jewish community of Tzfat decided to build a Jewish Hospital. Although the project involved a leap of faith for the cash-strapped Jews of Tzfat, they felt that they had no choice, because the alternative was to continue to use the existing missionary hospital and risk the missionary activities of its staff. New branches of the hospital, the Rothschild Hospital, were added as time passed, and when Tzfat's present hospital, Rivka Ziv, was completed in 1973, the question arose....what would happen to the magnificent structure which now sat empty? The answer was "The Michlala of Tzfat", a regional Community College which would serve not only Tzfat, but the entire surrounding area - Jewish, Arab and Druze alike. Today, thousands of students study at the Michlala, either full-time or part-time. The level of instruction is noted for its high level, and students from as far away as Afula and Acco come to Tzfat to take advantage of the wide variety of courses and opportunities that Tzfat's Michlala has to offer. A Mechina, a Preparatory course, is offered for students who need to first complete their high school credentials. Afterwards, courses are offered in almost every discipline imaginable. A sampling includes Health Studies B.A in Nursing - Physical Therapy, Occupational Therapy, Social Work, and Medical Imaging; A LL.B degree (Law); Applied Information Technology; Behavioral Sciences - Criminology, Sociology and Psychology; Culture and Arts, Mysticism (in conjunction with a local Rabbinical seminary), Music, Literature and Visual Arts. 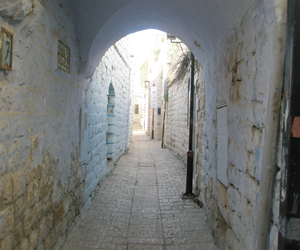 Several years ago, Tzfat's Michlala teamed up with Bar Ilan University to offer many of Bar Ilan's courses in Tzfat. Thus, a student who is preparing for a university degree may do much of the coursework in Tzfat and continue to live and work in the area, yet gain a university degree. This opportunity is a tremendous boost for the local population, most of whom study part-time while working and supporting their families. The Michlala sees itself as not only responsible for educating its students, but also as a community institution. Many of the Michlala's students have scholarships to study, and many more are given grants based on their volunteer work that they fulfill during the school year. The Michlala runs a tutoring program whereby Michlala students tutor children from disadvantaged families (the "Perach" program) which pays a large stipend for their studies. Presently, facilities for a law School are being constructed, and a new campus for a fourth Israeli medical school is anticipated in Tzfat. The population of Tzfat and the surrounding areas have a wide variety of options for higher education, and every year, more and more students take advantage of what the Tzfat Michlala has to offer.